If you are one of those who think intense starting lines, composite hulls, paneled high tech sails, and flotation and laminar flow tanks are just part of the big boat sailing world, you would be very wrong. Today’s remote control (RC) sailboats use the same technology as their larger counterparts. 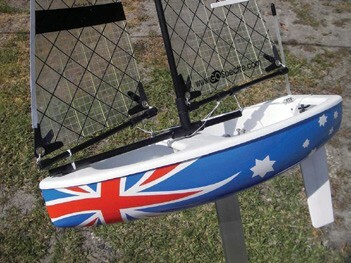 Model sailing can be found around the world. In the USA and Canada, the American Model Yachting Association (AMYA) is the primary association, with over 190 clubs on its roster offering 36 classes to race. There is a general consensus the total RC sailing population in the USA is somewhere between 7,000 to 10,000 individuals, with many of them being “big boat” sailors too. 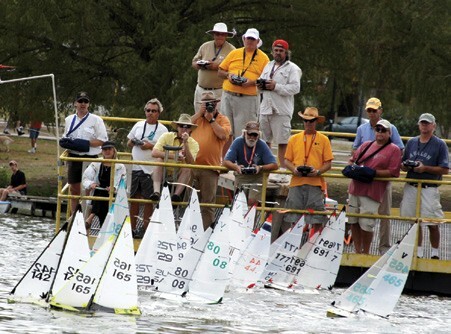 The smallest boats are the Footys – racing machines that are 12 inches long and can be held in your hand. The other end of the spectrum features the majestic J Boats – each 8 feet long, with 10-foot masts and weighing around 100 pounds. In between those two bookends are an assortment of every type of competitive boat, including models of well-known big boat classes like Solings, Stars, 12 Metres, etc., plus some very high tech leading edge classes like the IOM that require annual funding to keep up with the latest technological developments. Additionally, there are always new classes being developed like the Columbia 42s. Finally, there is even a classic vintage model class for folks who like to sail scale models of yesteryear. In short, there are RC boats for every preference from racing to cruising. One of the areas of rapid growth has been “shoulder season” sailing enjoyed by big boat sailors. Numerous clubs today have both categories built into their annual calendar of events. In the Northeast, Larchmont, Noroton, Pequot and New Bedford are examples of prominent clubs that have active RC sailing programs. Beyond shoulder season sailing, most RC clubs in the USA sail all year. True diehards, exemplified by the Dry Pants Model Yacht Club (dpmyc.com) in Connecticut, sail weekly through the winter, as long as their pond is not frozen and the temperature is above 35 degrees. That’s either true commitment or stupidity…perhaps a little of both. Either way, it’s fun!! Compared to big boat sailing, RC sailors can easily get into the sport for less than the cost of a gallon of good bottom paint. All 36 classes in the AMYA are available as kits. A newcomer can join the fun for less than $100, including all electronics. The kits are relatively easy to build and are terrific winter projects for an individual or family. Popular mid-size boats (36 to 39 inches), like the CR-914 and RC Laser, are available as complete packages with a radio transmitter for around $500. 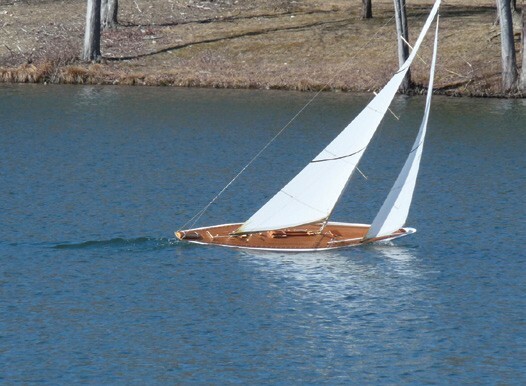 Of course, you can always have someone build you a J Boat for around $10,000; perhaps $15,000 for full scale detail. RC sailors always welcome newcomers, and are very helpful in terms of building boats and providing guidance on sailing technique and rules. If you have an interest in trying RC sailing, the very best resource is the AMYA website. It provides information on every aspect of the sport including details on all 36 classes and access to individual class secretaries. Best of all, you can even find a “contact person” at the nearest club to your home. Why not start a RC sailing group at your yacht club or in your neighborhood? It’s fun. It’s intense. It’s great for maintaining racing skills. It’s great for teaching or learning the racing rules. It’s great for developing junior sailing skills. Best of all, your annual maintenance cost on a 40-inch boat are a lot less than a 40-foot boat!!! A sailor for more than 60 years, Jim Godsman has raced and cruised from the Caribbean to Maine. A Past Commodore of Norwalk Yacht Club, he is a member of Essex Yacht Club and Dry Pants Model Yacht Club.